Denpasoft, Sekai Project and Whirlpool have released a sequel to their ninja catgirl eroge, titled NEKO-NIN exHeart 2. NEKO-NIN exHeart 2 is a sequel to the first comedic visual novel about a young guy to whom comes a pair of ninja catgirls. These girls are powerful demihumans and swear their servitude to the protagonist in order to fulfill an ancient contract. This leads to a lot of misadventures, which will now continue in the sequel. The main new attraction in the story is the introduction of two new characters. One is an amnesiac bunny girl that thinks that she’s actually a cat girl, while the other is a mysterious ninja named Ritsu, who kept an eye on the cast in secret. You can buy the adult edition of NEKO-NIN exHeart 2 on Denpasoft for $13.49 at 10% off. The game will cost $14.99 after the sale is over. A censored Steam version of the game is also available for $8.99 at 10% off until May 4th. Once the sale is over, the game will cost around $10. 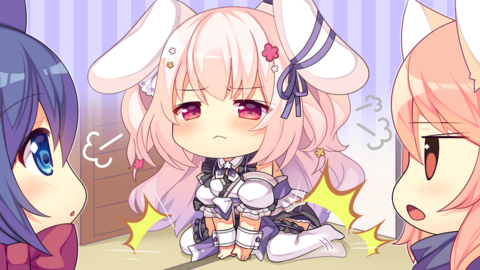 Do note that, in order to remove censoring from the Steam version of the game, you will have to purchase an 18+ DLC from Denpasoft, which is currently on sale for $4.49 and will later cost $4.99. Keep an eye out for future new lewd releases by following us on Twitter and Tumblr.